Right under two months has elapsed since my son announced he is going to quit his job with Microsoft to hike the Appalachian Trail in 2017. I see this as a sign for me to slow down and look where I am going. I have stopped accepting new clients at my practice and have shared with a select few individuals my intentions for taking some needed time off. Their overwhelming response has been positive and supportive. But now my thoughts are turning to logistics. Sure, my son is capable of achieving an enormous task like hiking almost 2200 miles up and down over mountains from Maine to Georgia. But even if my goal is much simpler section hikes, how am I going to do this? My hiking skills consist of going to scenic areas and walking on nice trails during the day. My camping skills include less than a half dozen times of throwing a ton of crap in the back of my car and then unloading it at a nice campsite. And my physical condition? Let’s just say it’s not very impressive. A wonderful client of mine knew about my son’s intentions and promptly gifted me with a copy of Jennifer Pharr Davis’s book, Becoming Odyssa. I recently read it in Cincinnati while visiting my parents for Thanksgiving. So I got out my computer yesterday and typed in “Appalachian Trail Institute”. What came up was a website, warrendoyle.com, with a quote: “Not all who wander are lost.” Sounded cool. I read lots of stuff before finding a contact number and dialed it from the couch in my living room. “Hello”, said a an older man’s voice who appeared to be engaged in physical labor- like walking in the woods. “Hello! I am wanting to find out about The Appalachian Trail Institute,” I said. I was promptly given contact information and the call ended. Jennifer Pharr Davis is an American long distance hiker, author, speaker, National Geographic Adventurer of the Year, and Ambassador for the American Hiking Society. She has hiked over 12,000 miles on six different continents, including thru-hikes on the Pacific Crest Trail, the Appalachian Trail (three times), the Colorado Trail, the Long Trail in Vermont, the Bibbulmun Track in Australia, and numerous trails in Europe and South America. 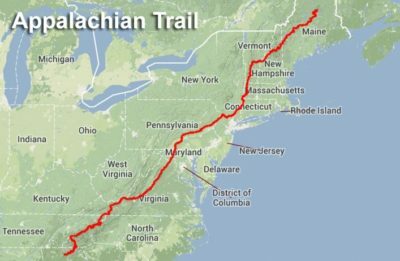 In 2011, Pharr Davis set the unofficial record for the fastest thru-hike of the Appalachian Trail with a time of 46 days, 11 hours, and 20 minutes, an average of 47 miles (76 km) a day. That’s why I am currently kind of excited and nervous. Jen just sent me an email saying I am now enrolled in the Appalachian Trail Institute. Looks like I’m going to be in Hot Springs, NC two weeks before Christmas.